You’ll find a lot of things to do with the kids this March. Expect many more activities the week of spring break — March 12-16 — to help you keep kids busy when school is out. Rodeo Austin Cowboy Breakfast. Eat breakfast like a cowboy. 6 a.m. March 2. Long Center, 701 W. Riverside Drive. rodeoaustin.com. Texas Independence Day Parade. Celebrate the history of Texas. Free. 9:30 a.m. March 3. Congress Ave. celebratetexas.org. Domain Northside Kids. Come to the lawn at the Domain Northside for activities for kids 18 months to 6 years old. Free. 10 a.m.-noon March 7. Register, domainnorthside.com. Rodeo Austin. Watch the pigs race, the bullriders, barrel racers and more. $5-$8 fairgrounds admission, $20-$36 rodeo seats. March 10-24. Expo Center, 9100 Decker Lake Road. Safe Baby Academy. Learn how to care for your baby. 9 a.m. March 3, Seton Southwest, 7900 FM 1826. 1 p.m. March 3, Baylor Scott & White Medical Center Round Rock, 300 University Blvd., Round Rock. 5 p.m. March 5, People’s Clinic, 1101 Camino La Costa. 9 a.m. March 10, Seton Northwest, 11113 Research Blvd. 9 a.m. March 17, Seton Medical Center Williamson, 201 Seton Parkway, Round Rock. 9 a.m. March 23, CommUnity Care Clinic, 2901 Montopolis Drive (in Spanish). 9 a.m. March 24, CommUnity Care Clinic, 2901 Montopolis Drive. Art in the Park. Explore art hands-on for kids with and without different abilities. Free. 9 a.m.-2 p.m. March 22. Fiesta Gardens, 2101 Jesse E. Segovia. www.vsatx.org. Dance Through India. Celebrate different dances. 2-4 p.m. March 25. Asian American Resource Center, 8401 Cameron Road. austintexas.gov/aarc. Blanton Museum of Art. Look. Think. Make. Drop in and make art every Thursday. 12 p.m.-4 p.m. Admission is free on Thursdays. Blanton Museum of Art. 200 E. Martin Luther King Jr. Blvd. blantonmuseum.org. “Nugget and Fang!” ArtsPower’s musical about a shark and a minnow that get along. $9-$12. Noon March 10. One World Theatre, 7701 Bee Cave Road. oneworldtheatre.org. Movies in the Park. “Moana.” 7 p.m. March 8. Ramsey Park. Free. 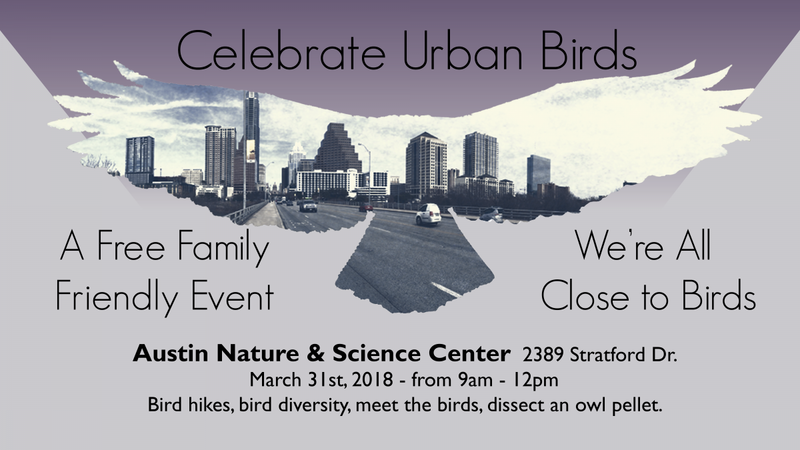 austinparks.org. Asian American Resource Center. Little Seedlings Storytime. Hear Dr. Seuss’ stories in Korean, Chinese and English. 10 a.m. March 2. Indian American Children’s Literature. Celebrate Indian literature with stories, crafts and games. Free. 2-4 p.m. March 18. Asian American Resource Center, 8401 Cameron Road. austintexas.gov/aarc. Barnes & Noble Events: Dr. Seuss Birthday Celebration. 6:30 p.m. March 2, all locations. 11 a.m. Saturdays story times at all locations: “The Very Hungry Caterpillar.” March 3. “The Magician’s Hat.” March 10. “The Gingerbread Man” and the “Leprechaun Loose at School.” March 17. “Little Blue Truck.” March 24. “The Duckling Gets a Cookie?” March 31. “This one blows up and this one inflates itself!” Seth and Evelyn Ledezma, 9 and 7 year-old, recreate Angry Birds characters “Bomb Bird” and “Atomic Bird” among other creatures at Crafternoon at the Manchaca Branch of Austin Public Library. Art Smart: Native American Celebration. 10:15 a.m. March 1, Pleasant Hill Branch. “Anasi and the Golden Box of Stories.” For ages 5 and up. 3:30 p.m. March 2, St. John Branch. 3 p.m. March 3, Central Library. 10:15 a.m. March 22, Cepeda Branch. 2 p.m. March 24, Old Quarry Branch. 11 a.m. March 27, Terrazas Branch. 10:30 a.m. March 28, Willie Mae Kirk Branch. 3:30 p.m. March 29, Pleasant Hill Branch. Express Yourself through Media and Technology. 1 p.m. March 3, March 24, Ruiz Branch. 10:30 a.m. March 3, 10, 17, 24, St. John Branch. Dr. Seuss Storytime. 11 a.m. March 3, Carver Branch. Bow Wow Reading with Bonnie the Dog. 11:30 a.m. March 3, March 10, 17, 24, March 31, Yarborough Branch. Bow Wow Reading with Aussie. 3:30 p.m. March 7, North Village Branch. Mornings with Moxie. 10 a.m. March 10, Manchaca Road Branch. Saturday Family Movie: “Captain Underpants Movie.” 1 p.m. March 3, St. John Branch. Crafternoon. 3 p.m. March 5, Dove Springs Recreation Center. 4:30 p.m. March 8, Twin Oaks Branch. 2 p.m. March 14, Cepeda Branch. 2:30 p.m. March 14, Carver Branch. 3 p.m. March 12, 19, 26, Dove Springs Recreation Center. 3:30 p.m. March 27, Howson Branch. Kids’ Yoga. 3:30 p.m. March 5, 19, 26,Yarborough Branch. Girls Who Code Summer Immersion Information Session. 5 p.m. March 5, Manchaca Road Branch. 3:30 p.m. March 8, Carver Branch. Tabletop Tuesday. Games to play. 5 p.m. Tuesdays, Central Library. Teen Tech Week: Coding. 3:30 p.m. March 7, Carver Branch. Robot Petting Zoo. 2 p.m. March 11, Central Library. “Ready Player One.” 2 p.m. March 12. Pi Day. 1:30 p.m. March 14, Central Library. Bristle Bots. 2:30 p.m. March 15. Stop Motion Animation. 2 p.m. March 16, Central Library. Tech Thursday. 4:30 p.m. March 8, Ruiz Branch. Teen Manga Book Club. 5:30 p.m. March 8, Little Walnut Creek Branch. Teen Book Club “Caravel.” 6:30 p.m. March 8, Spicewood Springs Branch. “Bunker Diary.” 3 p.m. March 10, Central Library. “Eliza and Her Monsters.” 6:30 p.m. March 20, Howson Branch. Night Builders: Family Lego Lab. 7:30 p.m. March 8, Hampton Branch at Oak Hill. Music and Movement. 11 a.m. March 9, Old Quarry Branch. 11 a.m. March 12, Pleasant Hill Branch. 3:30 p.m. March 21, March 28, Ruiz Branch. 11 a.m. March 22, March 29, Howson Branch. Friday Movie Matinee: “Wonder.” 3:30 p.m. March 9, Carver Branch. “Sing.” 3:30 p.m. March 16, Old Quarry Branch. Perler Bead Saturdays. Noon March 10, University Hills Branch. Saturday Movie Matinee, “Despicable Me 3.” 2 p.m. March 10, University Hills Branch. Austin Ukestra. 1 p.m. March 11, Recycled Reads Bookstore. Women’s History Month Film Series: “Wonder Woman.” 3:30 p.m. March 12, Old Quarry Branch. Family Movie Night: “Jumanji.” 4 p.m. March 13, Cepeda Branch. “Robots.” 4 p.m. March 15, Cepeda Branch. NBTween Book Club: “The Girl Who Drank the Moon.” 4 p.m. March 14, Howson Branch. “The Nest.” 6 p.m. March 15, Spicewood Springs Branch. “Pax,” 6 p.m. March 29, Twin Oaks Branch. PAW Patrol Party. 10:15 a.m. March 16, Carver Branch. Tween STEM Lab. Electric Sculpture with Squishy Circuits. 3 p.m. March 16, Cepeda Branch. The Third Floor Corridor: Teen Harry Potter Club. 2 p.m. March 18, Central Library. Pajama Storytime. 6 p.m. March 19, University Hills Branch. 6 p.m. March 22, Spicewood Springs Branch. 6 p.m .March 27, Old Quarry Branch. Book Circle. 3:30 p.m. March 20, March 27, Twin Oaks Branch. 6 p.m. March 26, University Hills Branch. Mother-Daughter Book Club: “The Evolution of Calpurnia Tate.” 6 p.m. March 21, Hampton Branch. Family Craft Night. 6:30 p.m. March 21, Howson Branch. Fix-It Clinic. Learn how to fix your broken stuff. Noon March 24, Austin Habitat for Humanity ReStore. Mayor’s Bookclub “Exit West.” 1 p.m. March 24, Manchaca Road Branch.